This is the other flavor that caught my eye Thursday night: Vanilla Honey Granola. I just hope the honey flavor isn't as potent as the Haagen-Daz version. 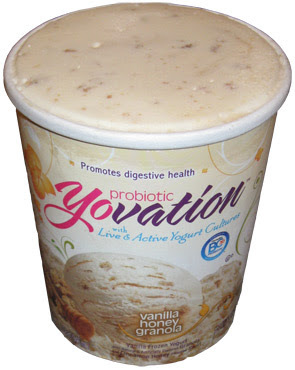 So we have another tasty looking probiotic Yovation with live and active yogurt cultures. I don't know any specifics about how the cultures in a serving of frozen yogurt hold up against a serving of regular yogurt, but what ever it is, it should be good for you. Now I had a sample last night, and I just had another good size serving tonight ...and I like it! It's a nice, pleasantly mild flavor mixed with little granola bits everywhere. The honey is mild with no annoying aftertaste. Just a plain and simple flavor. To be honest, I think I might prefer this to the Cookie Fudge Crunch Yovation. It's just ....modest ....sorry, I keep saying the same thing. The whole yogurt vibe is pretty weak on this one, actually, I kinda forgot I was eating yogurt. I didn't really notice an aftertaste either. Cool. I'm not really noticing the chewiness of the other sample as well, not that the other sample was overly chewy, and this one is just a smidge tough, but I've already grown use to it. I'm sure it helps that it's really hot tonight and my treat was quick to melt, but still, I can deal with the mild rubbery nature when the flavor is pleasant. The only think that has bothered me with my samples is the honey, but I think the chilly nature of dry ice has damaged the poor honey in my sample. It's very crystalline, kinda like it's been freezer burned, but I'm pretty confident this is due to the shipping process, and not a typical sample. I don't like being -100 F, so why should the honey (but I'll ask to make sure ...yup, Yovation agrees it happened during shipping). So, let me say it one more time: This is a nice mild flavor that just feels healthy, I mean, when is eating granola ever unhealthy? (unless you did something evil like deep fry it). Nice job Pierre's, spoons up! On Second Scoop: This really is a nice frozen yogurt and I really dig the flavor. The granola bits put me into that same happy place that I go to when I dunk oatmeal cookies in icy cold milk.